I’d never cold brewed before, but figured I’d give it a try. My Twitter pal, Michelle, shared her delicious recipe for Cold Brew Coffee Latte. Michelle’s recipe is for a concentrated coffee that gets diluted with milk or water, so I modified her recipe a bit to dilute it up front. In a large bowl, stir 1/2 cup ground coffee into 3 1/2 cups water. Cover and let sit on counter or in refrigerator for at least 12 hours. Use a fine mesh sieve lined with paper towels to strain cold-brewed coffee into another container. 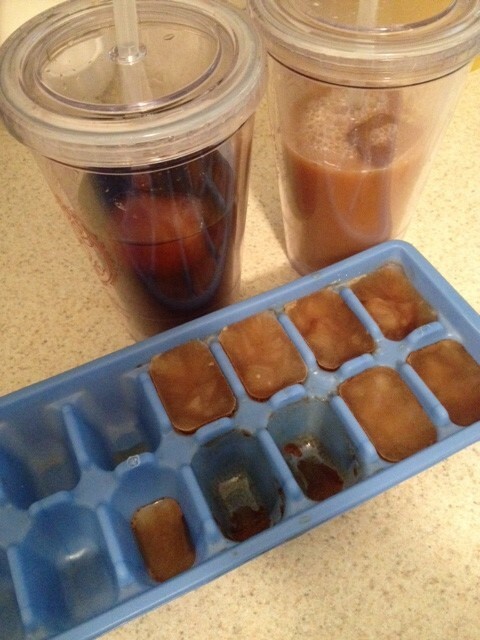 Pour into ice cube trays and/or refrigerate. Enjoy within a week or so of brewing. To create simple syrup, mix 1 cup boiling water with 1 cup of granulated sugar. Stir to dissolve sugar. Split and scrape out seeds from a vanilla bean, if desired, and reserve seeds for another use. Place remaining shell in simple syrup to infuse with vanilla flavor. Store syrup in refrigerator for about one month. Pour desired amount of cold coffee into a glass and slowly add simple syrup until you achieve desired sweetness. If you'd like an iced latte, add milk or cream. Enjoy! Have you made cold-brewed coffee before? Do you prefer your coffee iced or hot?